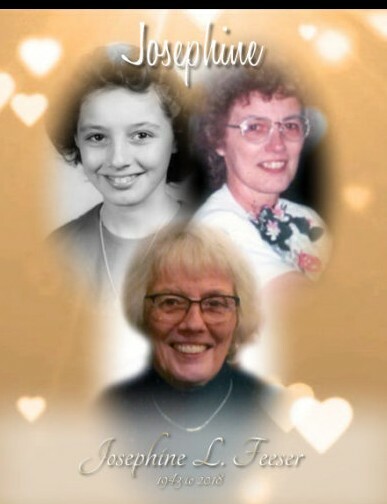 Obituary for Josephine L. Feeser | Kenworthy Funeral Home, Inc.
Josephine L. Feeser, 75, of Hanover, PA, entered God’s care, Saturday, October 13, 2018 at UPMC Hanover Hospital with her loving family by her side. Born June 12, 1943, in Hanover, PA, Josephine was the daughter of the late Richard J. and Helen M. (Warner) Reese. She was the loving wife of Ralph J. Feeser, with whom she shared fifty-two years of marriage. Josephine was a member of St. David’s United Church of Christ. She worked as a head cashier at Lowe’s of Hanover for over sixteen years until her retirement in 2006. Josephine enjoyed knitting, crocheting, playing cards, bowling, baking, traveling, and especially loved spending time with her grandchildren. In addition to her loving husband, Ralph, Josephine is survived by her children, Troy A. Feeser (Kathy) Hanover, PA, Melinda R. Rabenstine (Mark) of Spring Grove, PA; Brian E. Feeser (Chris) Sugar Hill, GA, and Chad D. Feeser (Jennifer) of Pembroke, KY; four grandchildren, Tyler, Logan, Haley and Gracie; three brothers, Richard J. Reese, Jr. of Hanover, PA, Garry E. Reese of Gettysburg, PA, and Howard H. Reese of Hanover, PA; and two sisters, Mary Ellen Ernst of New Oxford, PA, and Kay Wildasin of Hanover, PA.
A funeral service to celebrate and remember Josephine will be held 11:00 AM, Thursday, October 18, 2018 at the Kenworthy Funeral Home, Inc., 269 Frederick Street, Hanover, PA with Rev. Scott A. Sager officiating. Burial will be in Rest Haven Cemetery, Hanover, PA. A viewing and time to share memories with the family will be held from 6:00-8:00 PM, Wednesday, October 17, 2018 at the funeral home. 1249 Cocoa Avenue, Suite 115, P.O. Box 852, Hershey, PA 17033-0852.